If you are looking for an alternative water source for your home, you should consider digging a well. When you decide to have a water well on your property, it is important to understand the types of wells available so that you can make the best decision. It is also important to talk to an expert before you make this important decision. The well that you choose will determine the water quality and quantity that you receive. It will also affect the maintenance process that you will require. Dug wells are shallow and they are not the best option for your drinking water. This type of well poses the highest risk of contamination of the water supply due to poor protection from surface water. A dug well usually consists of a large diameter hole that is usually over 2 feet wide, and it can be constructed by hand or using excavation equipment. The large-diameter wells are usually constructed using corrugated galvanized steel or prefabricated concrete tile. Older wells are often constructed of stone, brick, or wood cribbing and they are very susceptible to surface-water seepage. Bored wells are constructed using a boring machine and they usually have an average depth of about 15 m or 50 ft., although some wells are 30m or 100 ft. deep. The wells that are usually about 2 feet in diameter are constructed using an earth auger and concrete is the most common material used. As these wells are typically shallow, they are susceptible to contamination. Apart from the high risk of contamination, the low water levels mean that the wells are often the first to go dry during drought. The sand-point or driven-point wells are constructed using assembled lengths of pipe that are driven into the ground. These wells are usually small in diameter- about 2 inches or less, and they are less than 50 feet in depth. 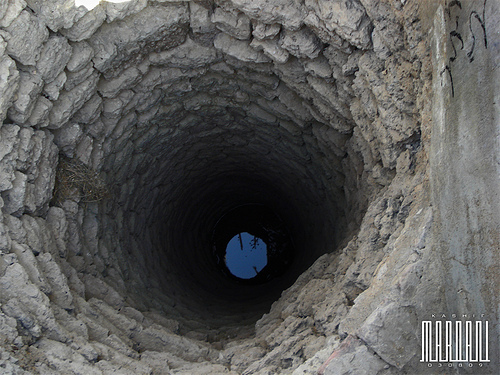 These types of wells can only be installed in locations with relatively loose soils, such as sand and gravel aquifers. They are driven into the ground or inserted using high water pressure and they are often only installed in places with a shallow water table that contains little or no stones. Drilled wells often refer to all the other types of wells, and this includes those that are constructed using a combination of driving and jetting. Drilled wells for farm use are usually 4 to 8 inches in diameter and they pose a low risk of contamination when properly constructed. Drilled wells can get water from bedrock aquifers and overburden. The overburden wells are usually composed of sands and gravels and they include those constructed into the geological materials that are above bedrock. Most water wells come with a well screen that lets groundwater into the well while keeping away sand and other materials. The well screen openings are properly sized to allow the sediment-free water to flow into the well, while enhancing the connection between the aquifer and the well. Water quality problems are directly related to the type of well, its condition, depth and the proximity to potential sources of contamination.